Photo by GLady via Pixabay. There was once upon a time a princess who was very beautiful. Her hair looked like burnished gold, her eyes were dark and mysterious, and her smile soft and full of sweetness. Three princes were her suitors; all three handsome, young and gallant, all three rich and proud and ardent, all three like Chaucer’s knight, loving “chevalrie, trouth and honour, freedom and curtesie.” The question was only whom she should choose for her husband. The whole court was in doubt; the wise Doctors of Marital Law shook their gray heads, but no decision was reached. At last the old King became impatient. “One has to handle the matter in the good old style,” he declared, “as it is done in all the time-hallowed chronicles of the past. One has to set a task for the three princes, and who best succeeds will be rewarded with the hand of the princess.” And thus the matter was settled. The next morning the princess called her first suitor and spoke to him. The prince, who was very scientific, felt aggrieved at such illogical words, and tried to argue the question. He brought the botanical atlas and the garden almanac, quoted Linnaeus, De Candolle, and other authorities, and proved in every way the utter impossibility of blue roses; but all he accomplished was to make the princess thoroughly angry. The prince protested, but his words were of no avail; and in the end he had to leave the palace, hurt and disappointed, and the princess called her second suitor. “Willingly,” answered the prince, “I shall search for them at once.” With these words he mounted his good steed (princes always mount good steeds; a mare seems to have no standing in fairy tales), and galloped away to find the blue roses for the princess. But though he searched everywhere, and looked into all the gardens, and knocked at the gates of all parks and palaces, his quest was in vain. He never found blue roses, and he returned to his far-away kingdom with a heavy and saddened heart, burdened by its own weariness and its own grief. So they went into the garden, and the next day they were married and, so far as I know, they lived happily ever after. Some years later the three princes met at the court of a neighboring king, and after a day’s hard hunting and an evening’s hard toasting they became, at midnight, very confidential, and spoke about courtship and marriage, men and women, love and blue roses. And while the three princes thus settled finally and for all, out of their own personal experiences, the age-old question of blue roses, the garden was steeped in all the glamour of a moon kissed summer night. Nightingales were singing their sweet and mysterious song in dusk-haunted bushes; strange flowers exhaled a perfumed fragrance; and even the grass was dew-wet, and herby, and trembling with a joyful, intense life. And in the darkest corner sat on a marble bank the king’s young daughter, with a gallant young knight. 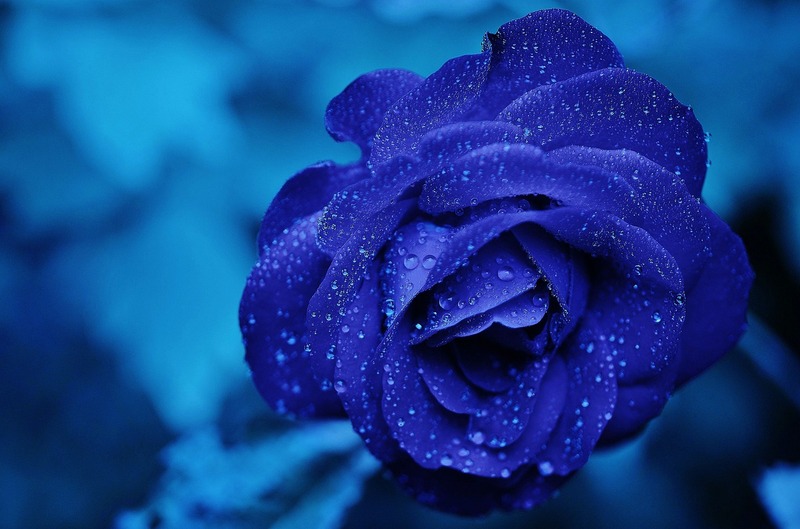 Their eyes were shining, their hands touched timidly, the glow of a first passion blushed on their cheeks, and with a tender voice the young princess asked her knight as Youth will always ask Love to bring her blue roses.